Replaces toy car and adds 4 new ones. Bethesda Softworks for their Vault-Tec logo and Vault Boy graphic, and for the Cuppa Joe logo. 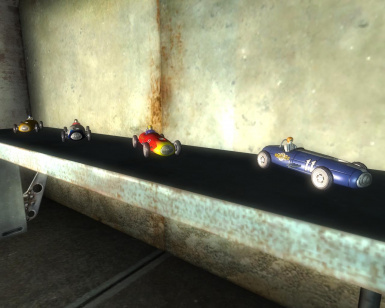 This mod for Fallout 3 is a set of new toys to add to your collection of displayable items. 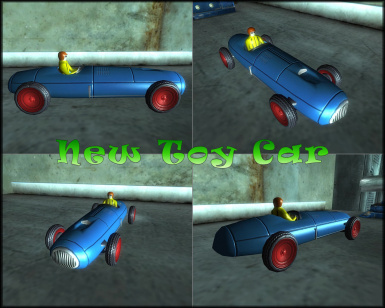 It currently includes a replacement for the toy car as well as 4 more new cars. 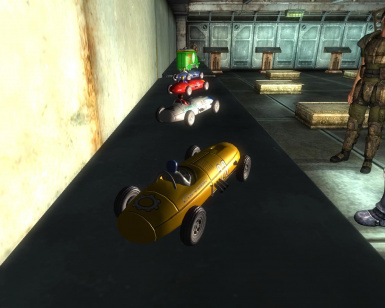 Each of the new cars has unique graphics representing other businesses of the Capital Wasteland. They are A Cuppa Joe, Corvega, Red Rocket and Vault-Tec. Seeing as how only Cuppa Joe and Vault-Tec had any useable pre-existing graphics, I took the liberty of creating some for the others. All vehicles possess a greater number of details to make them appear more realistic. A new icon for the Pipboy is also included for them. The model for all of the cars is also new and is loosely based on the original but with my own slant on design and level of detail. 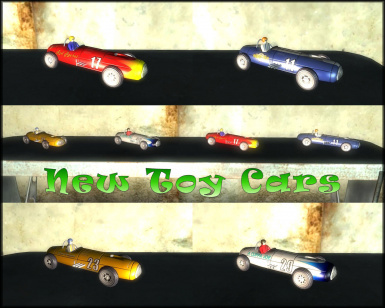 I used images of real and toy Indy cars from the late 50's and early 60's for a number of the details. 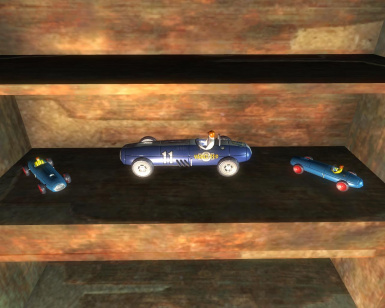 As well, the new cars are twice the size of the toy car for displayability ie. to show them off :).